I’ve read a number of books that talk about work / life balance but never a book as focused on it as this one. 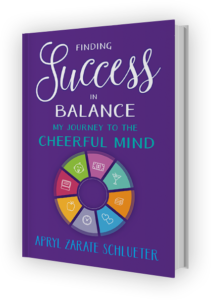 The author, Schleuter, includes her life story and tells of her many challenges of learning and finding the life balance she now has and teaches as a life coach. I found this book is more about Schleuter’s journey to find her own life balance than it is about the “how to” aspect of work / life balance. She certainly includes advice but it takes quite a while to get to that by eventually having steps and recommendations after her stories of discovering these for herself. It’s definitely a different style of book where the advice is given along with a detailed description and story of the author’s challenges and in most cases, failures to accomplish what she was after. Schleuter does overcome these challenges, but her own evidence shows this takes her years and many jobs to ultimately find what she is after. I had a hard time taking this in, since over and over I thought to myself, the author doesn’t know what she is doing, what can I learn from this? In the end, there is good lessons learned and teachings by the author, but I’m not sure the journey of getting there helped me in any way, as this is something that would be unique to any individual and each person will find their own path if they continue on such a trial and error as the author here does. There is sections on career and life, relationship, finances, fun and free time. All are good and worth the read for, but depending on how much back story you want to know, you can probably skim through these sections pretty quick to get to the meat of the book, which is the advice, her lessons learned and her now active practice as a life coach running her business, the Cheerful Mind. Also, there is a lot of discussion dedicated on managing stress, as it seems to be the bane of Schleuter, through her life. I’ve always been fortunately to enjoy many hobbies, sports and pass times that seem to kill my stress levels. I’m also quick to engage in any work I do, so its easy for me to enjoy a LOT of activities, so I really struggled to relate the many stress inducing challenges the book describes and wants to help with. The author goes through quite a journey to find ways of reducing to only a tolerable level of stress in many cases, but it seems that stress is still a continuous barrier for the author. I guess if one struggles with this, it would be easier to relate to, but for me, stress is just a non-factor as I handle and eliminate stress very successfully. Aside from meditation and yoga, these all require outsite intervention, which I don’t believe is really handling the problem of stress at all. My methods are completely different and easier for me to do without outside help so I didn’t put much though to these as they don’t do the same thing for me at all. However, the journey to handle stress and manage it for yourself will always be unique and knowing more ways and possibilities for that useful if you need to explore this for yourself. Despite not connecting closely with everything in this book, just because Schleuter’s lifestyle is very different from mine (even though we are both engineers), the book covers some great topics, provides sound advice and explores a journey of the author’s story in getting to her point of work / life balance, which I commend and recommend anyone to strive for. So, its easy to recommend this book, its a fast read and helpful in many ways. I hope you enjoy it as well!